The Friday night mass shooting at Midtown Tallahassee's Hot Yoga studio did not deter some 200 yoga practitioners from a special downtown gathering the following day, Saturday, Nov. 3. 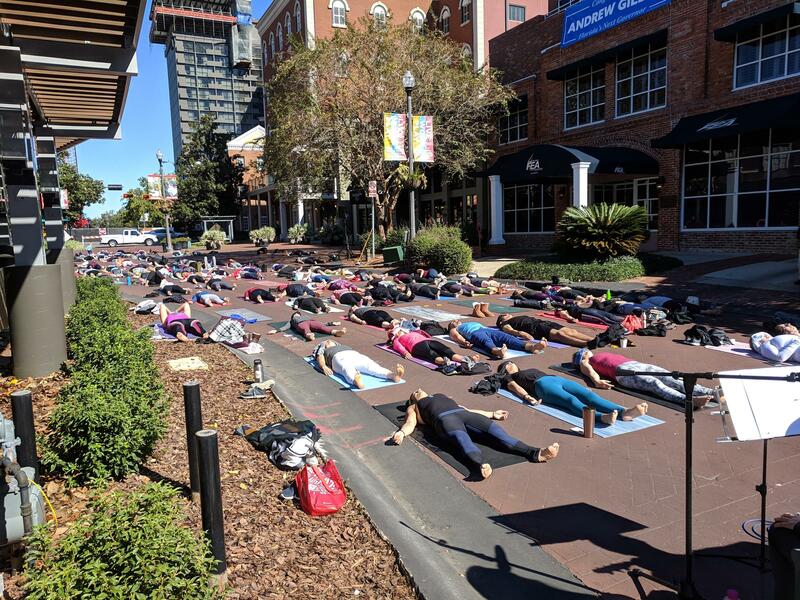 Downtown Tallahassee's Adams Street was the site of the Yoga for a Cause event. The Yoga for a Cause event had started as a fundraiser for Hurricane Michael storm victims. Then came Friday night's shooting and event host McKenzie Lohbeck considered cancelling the Adams Street exercises. "I was getting an overwhelming amount of voicemails, text messages, calls and e-mails," she said. "People saying, 'This is just so important; you have to keep this going!'" Participant Eddie Kring called it a source of unity and healing. "Just to show each other love and to show the world this is who we are in Tallahassee," he exclaimed. "This is our city, this is our home and we are a loving and close community!" While 9th District State Representative Lorrane Ausley, a longtime yoga devotee herself, pledged to push prevention in the Legislature. "Guns need to be not as accessible as they are to people with mental illness and we need to put more resources into mental health services," she said. Meanwhile, Florida's Capital City was still struggling to understand just what had happened and endlessly asking, "Why?" Two people died and five were injured in a shooting at a hot yoga studio Friday evening in Tallahassee Florida. The gunman is also dead after shooting himself.